Whitefriars Glassworks, an institution in British glass making survived over 300 years before the last of the burning furnaces was put out in 1980. Although this glass is no longer in production pieces by designers such as Geoffrey Baxter have become one of the most sought after collectables in Studio Glass today and prices are going through the roof! The original home of Whitefriars glass was near Temple in London, it is because of this site that the glassworks was given its name. There originally stood an ancient monastry where the monks were dressed in white habits and were known as the “White Friars”. This glassworks has changed hands several times since being established in 1680. During its long history and before James Powell bought the works, the owners were a family called Holmes who successfully ran Whitefriars for over fifty years. It was in 1834 when James Powell, a famous wine merchant purchased the works and changed the name to “James Powell & Sons”. The original name of Whitefriars was not reverted back until 1963. In 1873 Harry Powell, grandson to James joined the works and by 1875 became Manager. Harry was responsible for some of the most innovative designs of the Arts and Crafts period and carried the works right through the First World War until his death in 1922. In 1923 the original works which stood in the heart of the City of London on the site of the monastry was moved to a new site in Wealdstone. A long tradition was that the furnaces should remain burning at all times, so when the site was moved a lit brazier was carried to the new site and used to ignite the very first furnace there. 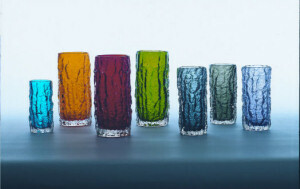 There are many designers which made Whitefriars Glass such an institution in the world of glass blowing including Harry Powell and James Hogan but today’s collectors seem to favour the designs of Geoffrey Baxter and his pieces are reaching huge prices on the secondary market at the moment. Geoffrey Baxter born 1922 was employed at the works as assistant designer in 1954. Working under the instruction of William Wilson, then Managing Director, he was the first permanent employee to be employed outside of the Powell family. Baxter graduated from the Royal College of Arts Industrial Glassware and was without doubt going to drive the company forward. The post war Britain realised that Sweden along with Finland and Denmark were pushing the glass making forward with the studio glass movement. This encouraged Baxter to take his influence from Scandinavian designs and combine them with his own contemporary ideas. He was responsible for creating the cased glass, this was coloured glass encased with clear crystal glass. The colours were rich ruby red, blue and green, produced in 1955. This was the start of the new modern trends from Baxter. He successfully created a balance between the traditional look and his bolder modern designs which in turn put Whitefriars Glass and British glass making back on the map. In 1964 William Wilson and Harry Dyer launched the “Knobbly Range” at the Blackpool Fair. These were free blown pieces of glass that were heavier and thicker than any other pieces produced before with a lumpy finish to the outside. Baxter was involved with producing the colours for the range, there were two choices either solid coloured cased glass or streaky colours in brown or green. The “Knobbly Range” was in production right through until 1972. Baxter went on to drive the company forward and give it a completely new lease of life, probably his most famous and definitely collectable ran ge is the “Textured Range” launched in 1967. It is no secret that Baxter produced the moulds for his new innovative design at home in his garage. Using natural materials such as tree bark he lined the moulds so that when the glass was blown into them it created a textured feel to the outside resembling the bark of a tree. He drew his inspiration from other natural and man-made materials. Once his moulds were created he used the factory to produce trials that he left on Wilson’s desk for him to see the minute he arrived back in the office from a holiday. Wilson was over the moon with the new range and it was given his blessing to go into production. Baxter used coiled wire to create other effects and then Baxter’s favourite vases was made by using irregular slabs of glass and building them together to make blocks on top of each other. This is the highly collectable “Cube Vase” or more commonly known today as the “Drunken Bricklayer”. Recently watching secondary market prices on internet auctions and at collectable fairs I have seen a rare 8” Aubergine colour Drunken Bricklayer sell from £600 up to as much as £1200. If you are starting a collection of Whitefriars then I highly recommend the “Bark Vases”, I bought my tangerine coloured vase for £40. 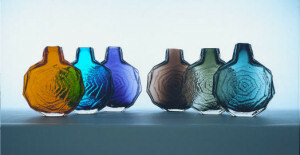 They also come in various colours such as Kingfisher blue, Ruby and Pewter to name but a few. There are many variations on the “textured range” which include “Banjo”, ”Sunburst” and clear glass designs such as “Glacier” and “Everest”. Most of these designs were made during the 1960’s so have a real retro feel to them which again is extremely popular amongst collectors at the moment. As with anything popular other companies began to make cheaper copies of this range and so in the mid 70’s only the Bark vases and some of the Glacier pieces were being made. Peter Wheeler who was only at Whitefriars for a very short time designed with Baxter the “Peacock Studio Range” in 1969. This was a fantastic design using a combination of colours, Peter was also responsible for the gold and orange vases which formed part of the “striped Studio Range”. 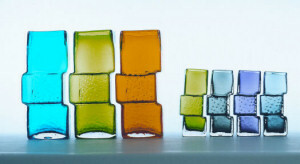 Whitefriars are also well known for their millifiore paperweights. Extremely difficult to make as all hand made and crafted Whitefriars became responsible for many of the special commissions and limited editions such as “the sailing of the Mayflower” and the Queen’s Silver Jubilee. In 1975 they produced an annual series of Christmas paperweights which proved very popular. You can tell if you have a genuine Whitefriars millifiore paperweight because it is recognised by the Whitefriars Monk trademark which is set within the paperweight along with a date the item was made. Another of Whitefriars talents was within their stained glass studio as the works was one of the leading makers of stained glass. The studio carried out the whole process themselves from melting the glass and flattening it through to cutting and leading. You can see many examples of Whitefriars stained glass windows in churches and cathedrals all over the world including St. Paul’s Cathedral in London. Unfortunately in 1980 the recession had hit and the Whitefriar’s works was struggling – when their orders at the annual trade fair at the NEC in Birmingham were not enough to cover overheads and demand for the glass had suddenly taken a downward slide, management had to make the difficult decision of closing the works and making its employees redundant. With continued costs of labour and fuel it made it impossible for the works to carry on trading. So one of England’s longest producing glass works came to an end but the memory still lives on with the upsurge of Whitefriars collectors. Whitefriars was British craftsmanship at its best, and collectors all over the world recognise this as examples on the secondary market are reaching fantastically high prices. I believe that now Whitefriars glass is commanding the prices that it deserves, it is just a shame that it takes the closure of a factory to do so. Best known for Industrial Art Glass made from the 1920s onwards. Also produced some fantastic stain glass from their stained glass department.